This post is sponsored by Lowe’s, all thoughts, words and opinions are my own. 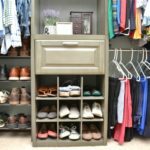 I think we all have those rooms in our house that we would love to completely gut and redesign if we had the time and the money. All too often these rooms get put on the backburner and other needs come first then all of a sudden you’re 5 years into living in that home and nothing has been done to it yet. 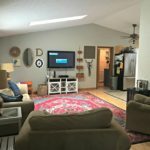 Today I want to show you a classic case of a room I really have struggled with in our new house and how I “made it over” without changing the footprint of the room or doing too much in the way of work and money. It’s AMAZING what a little effort and some creativity can get you! 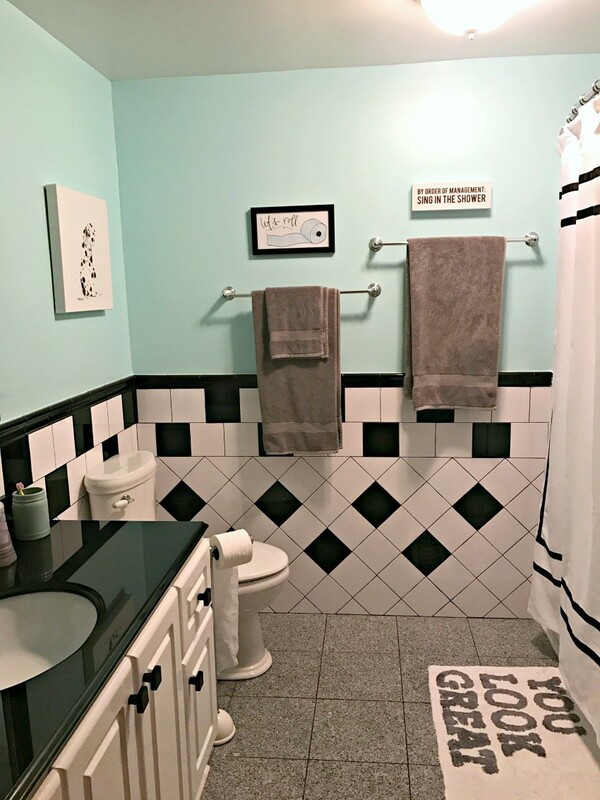 My Retro Black White and Teal Bathroom Makeover is a new favorite room in my house now and you can see how I did the whole thing for under $300 with the help of my friends at Lowe’s. 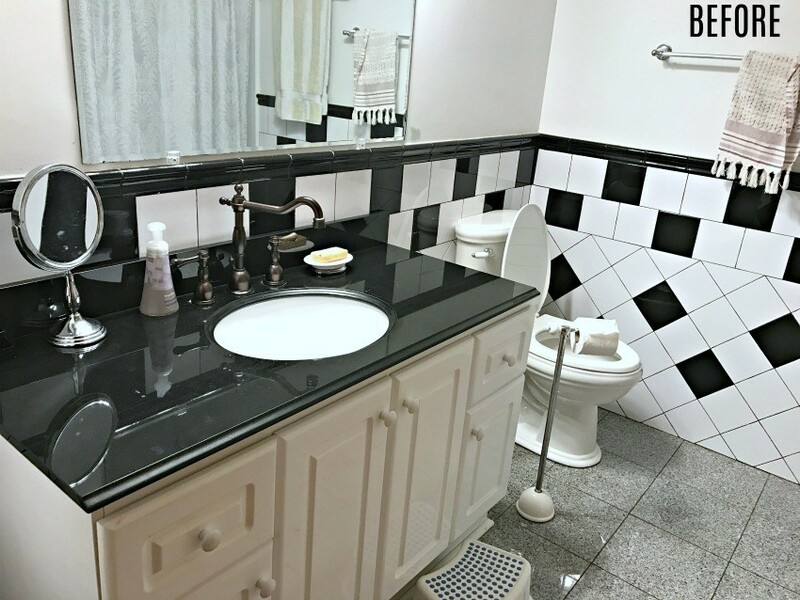 It all started with this black and white tiled bathroom. The tile wasn’t my favorite—it’s outdated and I really wish it was white subway tile, if I’m being honest. The vanity serves its purpose, but it’s nothing special. The mirror was off centered and needed a frame. The light fixture was builder’s grade at best and added no character to the room. And the shower rod was rusted and worn. 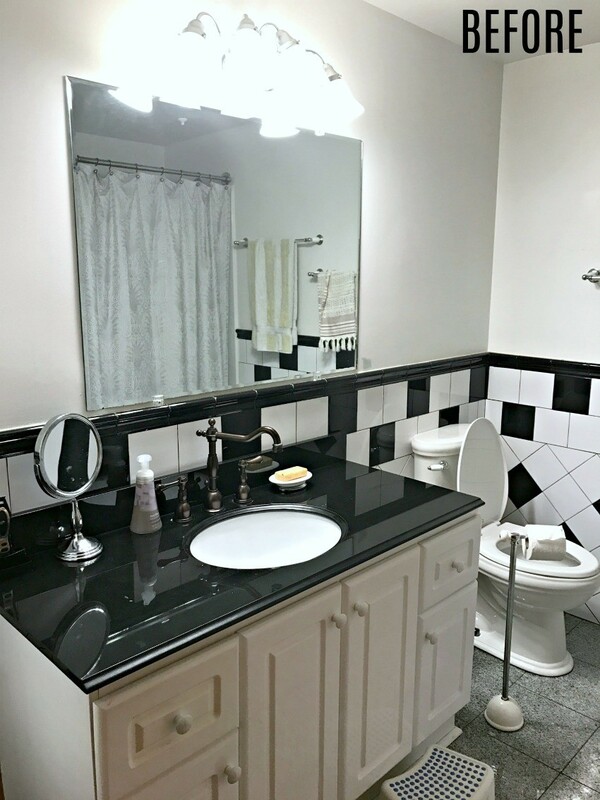 The previous owners had left the walls white and had laid down heated marble floors and black granite countertops. At least those were upgraded, but obviously this bathroom needed some work! 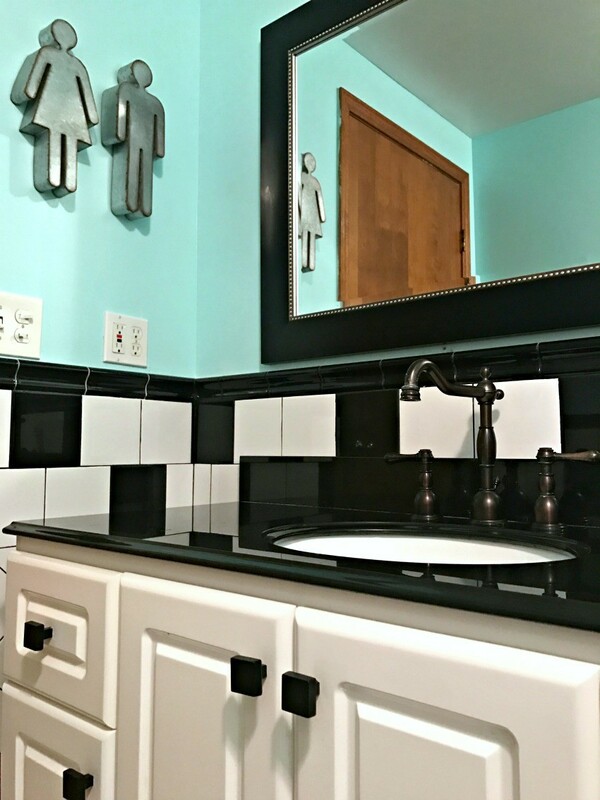 I had GRAND plans to rip that tile off the walls and add a shiplap to the walls, but honestly…if you think this bathroom is bad, you should see our Master Bathroom which is straight out of the 80’s. The Master Bathroom has taken priority over any big renovations in this house for the time being (more to come on that soon! ), so this bathroom will have to wait a bit before I can proceed with anything drastic. So rather than reinvent the wheel and let it sit there in all of it’s mismatched glory, I decided to embrace the retro vibe it was putting off and see what could be done with a couple hundred dollars and a few hours of effort…and to say I’m happy with the end result is an understatement. Everyone that goes into that bathroom comments on the black and white tile. It stands out like a sore thumb. And while it’s not AWFUL, it’s awful in the fact that we weren’t embracing it. The shower curtain was very classic, while the tile put off a retro vibe. The walls, mirror, and light gave no character and ultimately, the room had no design to it whatsoever. So I started doing what any good Pinterest user would do and I searched on Pinterest for Black and White bathroom inspiration. Immediately my screen was flooded with awesome teals, blacks, and whites…and loads of patterns. 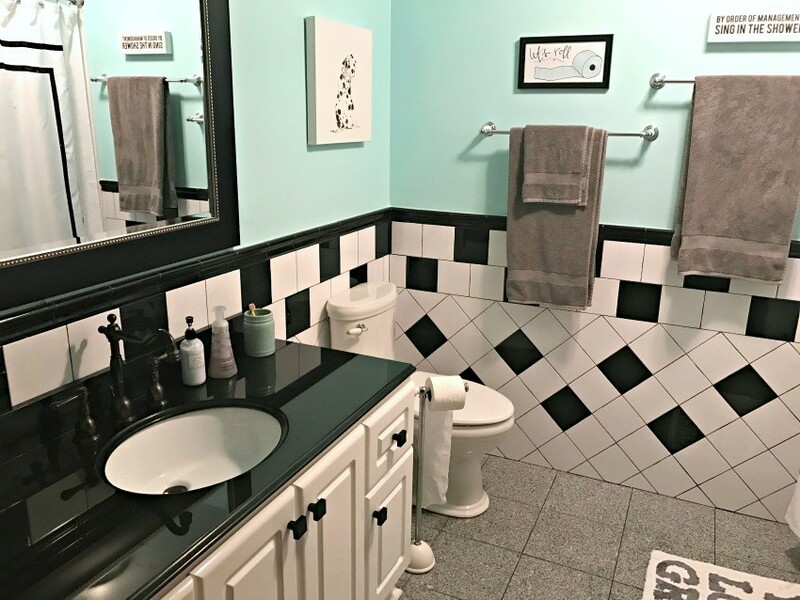 Since we weren’t in a place to replace tile, I had to will myself to skip by all the gorgeous black and white patterned tile I saw and continue on to look at ways to compliment the tile. 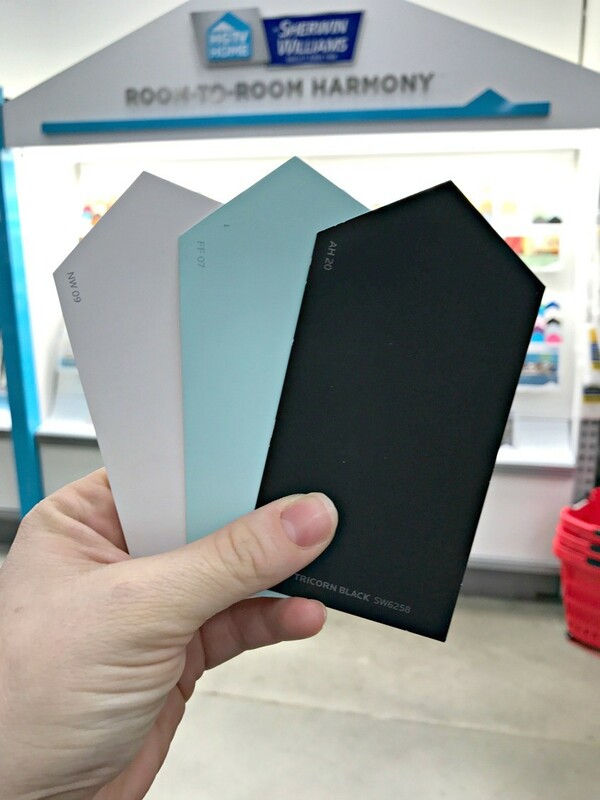 Ultimately I decided to go with a light teal color on the walls and chrome fixtures and I started making a list of all the things I wanted to do. Tip One: Make a wish list of things you’d like to do to your bathroom. The list is helpful because it lays it all out for you and then you can start pricing what you want to do and deciding what fits in your budget and what does not. In the fall we already had updated the shower head in that bathroom, so we at least had that crossed off our to-do list. Tip Two: Shop online at Lowe’s.com for ideas first. So then I got on the Lowe’s website and started searching for ideas. I find this helpful because then I have a good idea of what I wanted to look at before I even step foot in the store and honestly, I hate running from one place to another, so I prefer to just go and get all I need in one big trip and Lowe’s has always provided that for me! Tip Three: Narrow down what you can afford to do within your budget and head to Lowe’s to get your items. I also had a few items on hand from previous shopping trips including some artwork and bathroom linens. Finally, I had two white shelves from my old house that I used, as well. Overall, I spent about $300 and around 4 hours to update the room. Now let’s take a look at the character of the before and after and the steps in between! (This room has no natural lighting, so it proved difficult to photograph). 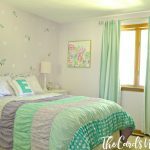 For this room I used the Sherwin Williams Ovation Paint in Satin in Tame Teal. I thought this color was a perfect accent to the black and white and added a pretty pop of color. Lowe’s had LOADS of color ideas, so I was able to literally get everything there that I needed for my room. 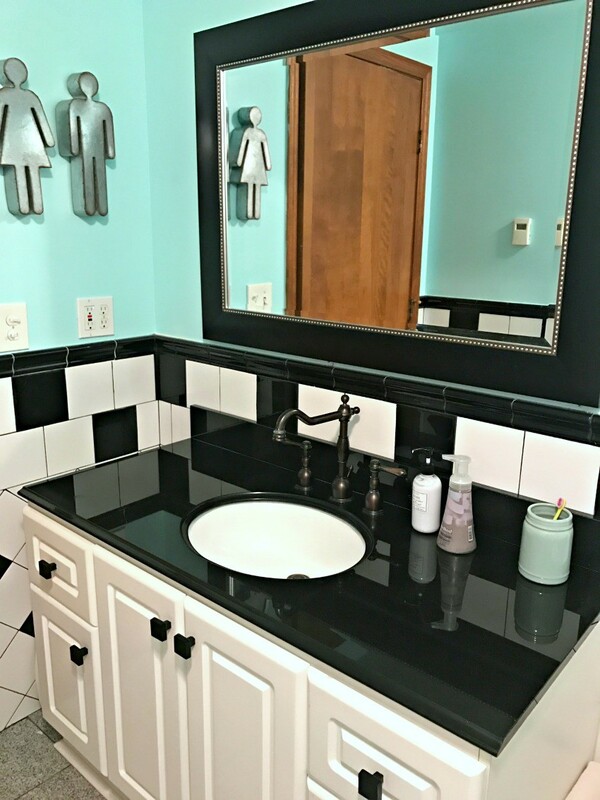 While my paint was mixing, I selected a simple Allen and Roth 3 light vanity light for above my mirror, then also chose a Black Framed Allen and Roth Mirror to replace our simple builders grade mirror in the bathroom. 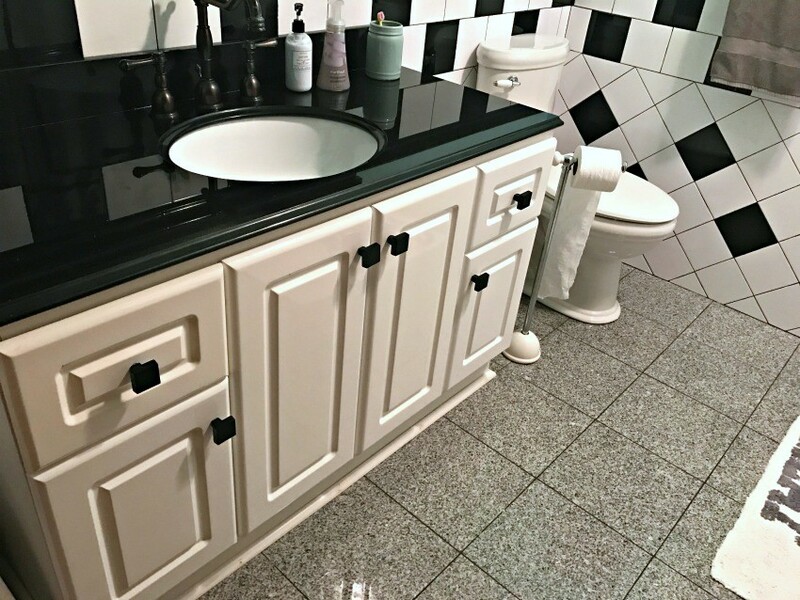 Finally, I added new black square knobs from Lowe’s awesome hardware options (they have tons!) and changed them out for a pop of contrast on the vanity. 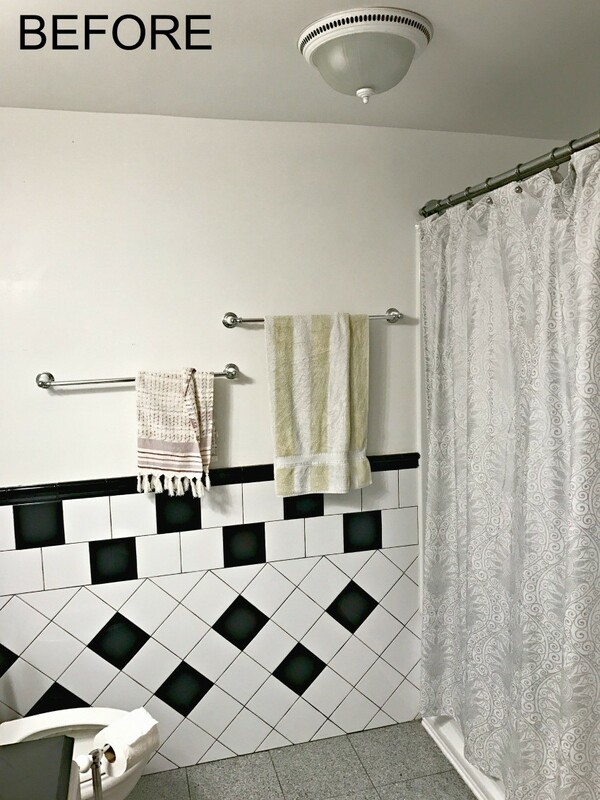 Finally, I added in a new Allen and Roth Black and White Shower Curtain and liner, along with a new Moen curved shower rod. 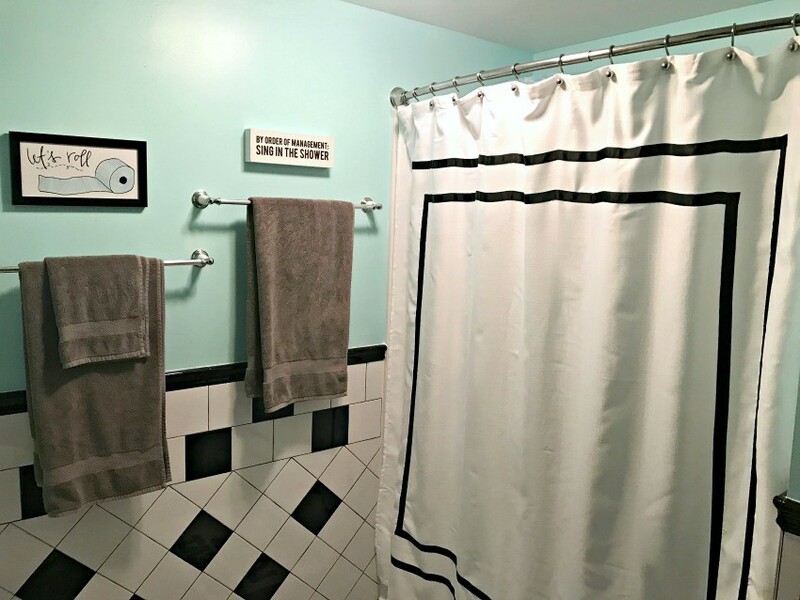 I added some artwork and new linens to the bathroom that really finished things up and tied it all together and it’s SO much more homey and pretty in there now. I just love it. This weekend we plan on tackling our hallway because with 90+ degree temps and thunder storms, it’s kind of nice to just stay inside and work on freshening up our home and bathrooms. 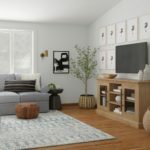 I hope this inspiration proves what an great difference you can make with small, budget friendly ways to update your house in no time at all! Get out those lists and start brainstorming and knock off one of those rooms on your to do list that is in dire need of a little TLC! Wow, you did a great job embracing the black and white theme! The black trimmed mirror and shower curtain really add the accent this room needed. I didn’t see the new light?? And, I so want to see the artwork on the wall up close, to see how you added the teal touch there. I also have to say i love the black faucet at the sink. If it’s functional, why not keep it? I usually scream when someone says paint the wood, but this is one time when a white door would look great. Thanks for sharing! Thanks so much for the kind words about the room. I need to add a photo of the light which was installed after the post was finished. We had some serious issues with installation, so I’ll definitely get to work adding that photo. Thanks for the reminder!